The 53rd story in the Falling Into College series by Richard Lobinske. The story occurs during late November, 2001. Maddie and Geoff Myerson host their extended family Thanksgiving dinner, including Daria, Michael, Karen and Derek. Meanwhile, Helen and Jake fly to California to spend the holiday with Quinn and her friends. Also, Jane and Mack go to Lawndale to spend the day with their respective family’s. Quinn is nervous to make a good impression by the time Helen and Jake arrive. Jane and Mack first eat with his family. At the Myerson dinner, Daria finds herself seated next to Jill and gets to meet infant Wayne while trying not to freak out too much about the large crowd. After their first dinner, Jane and Mack stop by a store for last minute supplies and find Sandi preparing to eat alone. They invite her to join them with the Lanes. In California, Quinn has devised a Thanksgiving picnic on the beach, looking out at the Pacific. Jake and Helen are pleased when passing boys mistake Helen for a college student. At the Lane dinner, Sandi says that she’s probably only going to attend Lawndale State for a year before going to California. 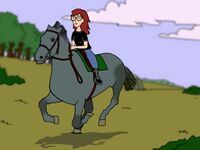 After dinner, Karen introduces everyone to the horses that they’ll ride and reassures Daria that her summer camp experience should not hold her back. Karen will ride her black mare, Evira and to Daria's horror, she will ride a huge, retired draft horse named Junior. "Daria Went Down To Georgia"
This page was last edited on 28 November 2013, at 12:47.